Time is a precious thing. Think about it: the punishment for some of the world’s worst crimes isn’t a monetary fine… It’s a time-fine (often jail time), which goes to show that time is valued more than money. This can lead to a fantastic user experience, social shares, and an abundance of site traffic… If you do it well. In this article, I’m sharing the benefits of using interactive content in your strategy, along with the five ways you can get started. Interactive content has been named as the future of content marketing. But, it’s not just a new phenomenon whose usage will decline rapidly in a matter of months. 46% of content marketers use interactive content, and that number is on the rise. Focusing on interactive content this year could position you a step ahead of the competition. 91% of B2B buyers prefer to consume interactive and visual content. Your ideal audience is already looking for interactive content. Talk about catering to their needs! Another key element of a successful marketing strategy is to educate your audience. If your audience don’t understand what you have to offer, or become confused at some point in their buying process, it could push them away — and into the arms of a competitor. …Making it a fantastic way to drive-up the results – including the ROI – of your campaigns. Businesses are always looking to drive up their conversion rate. Whether you’re looking to generate leads, collect email addresses or close sales, conversions are a key factor in many marketing campaigns. 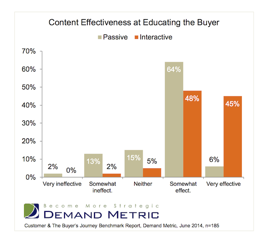 Interactive content has been proven to convert 2x better than traditional content types. If the primary objective of your marketing campaign isn’t to generate sales, you’re still likely to benefit from this content type. That’s because interactive content has been found to generate 4-5x more pageviews than static content. This surge in new visitors to your site could become long-term, high-paying customers, if they’re engaged. Now that you understand the benefits of using interactive content, let’s move onto the good stuff: the types of content your business can use to generate strong results, based on your marketing objectives. Buzzfeed is often referred to as being the King of Quizzes. It built its media empire using quizzes. But it’s not just big-name brands that can benefit from this type of interactive content. Kayla Hollatz is a small business owner that offers branding services. 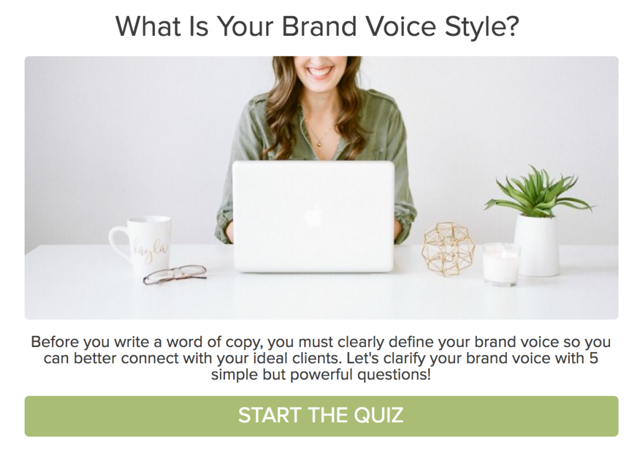 In an attempt to use interactive content to generate leads, she created a personality quiz called, “What Is Your Brand Voice Style?”. After embedding the quiz on her website, Kayla was able to generate 1,480 leads at a 55.8% conversion rate — all from one single piece of interactive content. You can achieve comparable results for your own business, and it’s likely to be more fun than you think! Another popular type of interactive content is calculators. However, unlike the quiz option, this format allows you to dive deeper into your audience’s needs, collecting information to build accurate buyer personas. That’s because calculators work by asking a user to input data. Based on their data, your piece of interactive content will follow a set formula to generate a result, visible to your user. You’ve got the opportunity to tailor this advice, depending on the outcome. This results in a better understanding of your customers, and the chance to create highly-specific content that appeals to each customer group. Let’s say that you’re a marketing agency who has decided to create a calculator. You ask your audience to input their annual turnover, how many employees are on the books, and their monthly expenses. In return, your calculator will suggest an affordable budget they can assign to marketing activities. The same can be applied vice versa: if the person using the calculator only has a budget of $100 per month, tailor the content they see on the final screen. Granted, investing in calculators can be a financial and time-related investment, but it caters to the one critical requirement of content marketing: relevancy. When we mention the word ‘infographic’, it’s not uncommon for business owners to shudder in their boots. After all, creating a strong infographic that drives organic results (without paid advertising or manual outreach) can be tough. That said, infographics are one of the most popular forms of static content; they’re liked and shared 3x more than other any other type of content on social media. If you create an interactive version, you could reach more people — and encourage them to convert when they visit your site. 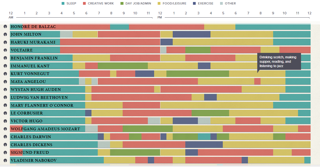 By hovering over the coloured sections of their infographic, I’m able to get more information on a specific topic. Not only does this get the user involved (catering to the interactive element), it allows publishers to add more value to their infographics without overwhelming the user with data. This tactic has proven particularly popular on Facebook, with carousel advertising formats performing 10x better than regular ads. Why? Because of the interactive element. 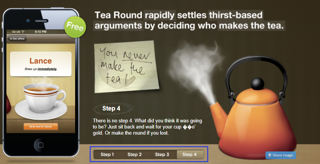 By splitting their explanation of using the product into four steps, the company has used a carousel format to pique the user’s interest when landing on their homepage. The information isn’t there for them to read instantly. They need to invest time and complete a manual action before learning more, making it a fantastic approach to getting their audience engaged with their content. Video content has proven to drive excellent results for marketers in various industries. In fact, 51% of marketers report that video has the best ROI of all content types. Your results can be supercharged if your video features an interactive element. Interactive videos come in many shapes and forms. You could create a video that gets your audience involved by clicking, typing, or performing another action. Because they’ve invested time into your content, it could result in longer average watch times — and positively impact conversion rate. The aim of any piece of content — interactive or otherwise — should be engagement. As it’s a metric proven to relate directly to purchasing decisions, introducing interactive content to your marketing strategy is the best way to really drive results. Published on 03/14/2018 by Elise Dopson. Hey Elle, This post was so informative. I’m excited to learn how-to build an interactive infographic. Elise Dopson is a freelance content marketing writer, specializing in long-form, data-driven content for B2B marketing and Saas companies. After working as an in-house copywriter for an SEO agency, she now helps brands to create actionable content that really drives results.